As a potential participant in the Sam Johnson Vietnam Archive Oral History Project, you may be curious about what is involved with being interviewed. The following is a brief synopsis of the steps and procedures involved in the interview process. Anyone from any country is welcome to participate in the Oral History Project. 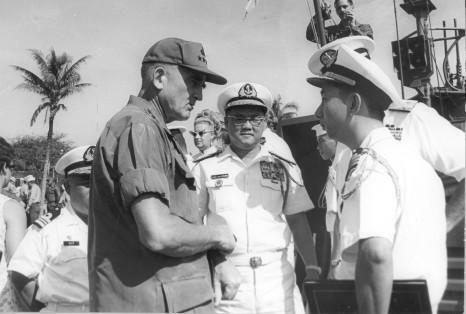 We are committed to preserving the history of the wars in Southeast Asia from the perspective of all participants, regardless of their country of service and whether or not the participant was a civilian or in the military at the time. We hope to include interviews with individuals from all of the participant countries. The Oral History Project has interviewed men and women from the United States, South Vietnam, North Vietnam, Australia, New Zealand, Great Britain, Thailand, and Canada. Everyone is welcome to participate. All participants will have the opportunity to be interviewed regardless of their political position, gender, race, or ethnicity. If you have any questions or concerns, please feel free to contact us at 806-742-9010 or to send us an email message. Once we receive your questionnaires, we will review them and enter your information into our participant database. As we have many individuals in the interview queue, it most likely will be some time before we are able to contact you to schedule an interview date and time. Rest assured that we will contact you as soon as possible. Depending on your location, we can conduct interviews in person, over the phone, or by using appropriate internet technologies. We can meet in person if you are near Lubbock, Texas, or are planning to visit Lubbock sometime in the future. Otherwise, for people who live in the United States, we can conduct your interview over the telephone. For those outside the U.S., we can conduct the interview via the internet. Before the interview, we will ask that you sign an Interview Agreement. The act of creating an oral history interview automatically creates complimentary copyright. As a result, both the interviewer and the interviewee/narrator must sign an agreement releasing their copyright control of the interview to the Vietnam Archive at Texas Tech University. If an agreement is not signed, the Vietnam Archive cannot make the interview recordings or transcripts available to students, scholars, and the general public. The Interview Agreement is not intended to restrict your rights to your own story and is not designed to prevent you from selling books, articles, or the movie rights to your story if you so desire. The agreement simply allows for public access to your interview and states that both the interviewee and the interviewer understand various libel issues. The purpose of conducting the interview is to preserve a historical record of your experiences regarding the wars in Southeast Asia. The length of the interview varies from person to person. We pledge to allow each individual the time he/she needs to relate their story. We will guide you through the interview with questions in a professional manner and allow you the opportunity to answer in any way and at length. The interviews are uncensored, unedited, and are designed to be as authentic a rendering of the narrator's Vietnam War experience as possible. Our interviews typically cover a wide range of topics and time. We are interested in your experiences before, during, and after the war. We will not discuss any topic about which you do not feel comfortable talking. All interviews are digitally recorded using our digital audio recorder and sometimes on video when the situation warrants. 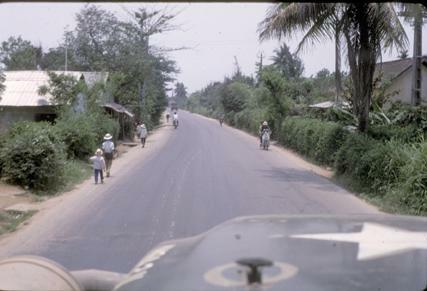 Recordings are transcribed and both recordings and transcripts will be made available to students, scholars, and the general public at the Vietnam Archive in Lubbock, Texas, as well as on the Internet through the Virtual Vietnam Archive. 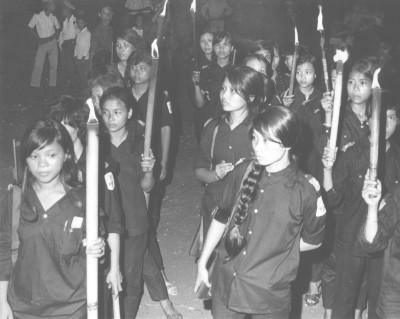 Torch bearing female Self-Defense Cadres. After conducting the interview we will create a transcript of the interview which will be sent to you for review. The purpose for your review of the transcript is to allow you the opportunity to correct names of people and places, and to correct dates and other factual information as necessary. Since the purpose of the transcript is to convey as closely as possible the tone, nature, and content of the oral interview, we avoid editing transcripts for grammar, syntax, or other esthetic reasons. You are also encouraged at this point to make any additions to the transcript as you see fit. We will indicate that these comments came after the original audio interview. We will give the transcript and audio a final review before depositing it into your collection at the Vietnam Archive and posting it online in the Virtual Vietnam Archive.